The digital magazine for the global steel pipe coating supply chain, from specifiers and operators to installers and maintenance specialists. Published quarterly, each edition covers developments in factory and field-applied protection and anti-corrosion coatings, application hardware, and Field Joint Coating systems. 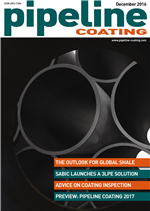 Pipeline Coating is a digital magazine from Applied Market Information that is specifically written for the global steel pipe coating industry. It delivers business, technology and project news to specifiers, operators and installers of steel pipelines and flowlines, including the latest innovations in coatings and coating products, materials and application technology, and maintenance and inspection techniques.